When I first conceived of the Palme Thursday feature, roughly a year and a half ago, I had a hunch it wasn’t going to be a click-bait blockbuster. (Long retrospectives on the winners of French film festivals generate less pageviews than Star Wars casting rumors. Go figure.) But I also knew that the enticement factor would vary wildly, depending on what film I chose to write about each month. That’s one reason this “journey,” as I called it at the beginning, hasn’t been mapped chronologically: Jumping around in time has allowed me to alternate between the most popular of Cannes winners, like Taxi Driver and Pulp Fiction, and the titles with a more niche appeal. It’s all about striking a balance. But in its devotion to capturing the rhythms of a bygone way of life, The Tree Of Wooden Clogs just might be a masterpiece. Certainly the jury of the 1978 Cannes Film Festival thought so. All nine members, among them Liv Ullmann and president Alan J. Pakula, voted unanimously to hand Italian director Ermanno Olmi the Palme D’Or. Beyond merely loving the film for its moments of beauty and quiet power, perhaps they understood it as the kind of movie that warrants recognition at a major festival—a work of great scope and integrity, as admirable for what it attempts as for what it achieves. Where else but Cannes should such cinematic ambition be rewarded? “Peasant epics,” as critics have dubbed them, were popular in Italy around the time of the film’s release, with some of the nation’s most acclaimed and socially minded filmmakers turning the plight of a marginalized working class into sprawling historical dramas. One year earlier, Cannes awarded top honors to Padre Padrone, from Paolo and Vittorio Taviani, and the year before that, Bernardo Bertolucci’s star-studded 1900 (featuring Robert De Niro, Gérard Depardieu, and Donald Sutherland, among other familiar faces) screened out of competition at the festival. But The Tree Of Wooden Clogs is a different animal—some might even say it’s the grand work the movement’s previous entries were building toward. Though often lumped in with the famed Italian neorealist directors, with whom he shared an era and focus on the underprivileged, Olmi resists the comparison—mainly because his contemporaries sometimes employed professional actors. Tree, which is generally thought of as the director’s magnum opus, doubles down on his casting philosophy: Not only is the entire ensemble made up of nonprofessionals, but they all speak Bergamasque, the dialect of the film’s rural Italian setting. The goal is verisimilitude; the actors, cast less for their chops than for their general appearance and presence, seem to meld into the environment. Olmi applies his experience as a documentarian to the loose narrative, creating the illusion of unbiased observation. For the most part, the movie operates like nonfiction, its characters (and agenda) coming into focus only gradually. The Tree Of Wooden Clogs covers roughly one year, circa turn of the 20th century, on a tract of farmland in Lombardy, the Italian region where Olmi was born. (If the film is autobiographical, it is only abstractly so; the filmmaker was born a good 30 years after the timeframe depicted.) The plot, if it can really be called that, concerns the parallel trials and tribulations of four families who live and work on the land. Very slowly, dramatic developments emerge: The local Catholic priest encourages one set of parents to send their gifted child to school, but the boy will have to walk several miles every day, over rough terrain in shabby shoes. A widow works to support her six children; the option to send two of them to the town orphanage weighs on her heart. A local young man tentatively courts his neighbor. A father and son bicker constantly, and often violently. The seasons change. Life trudges on. It’s the type of movie one might describe as “uneventful,” except that it’s really all events, most of them the ordinary stuff of hard rural living. Women wash clothes at the water. Men slaughter livestock. (Those squeamish about real on-screen animal death should take this as their warning.) Families husk corn until nightfall; after dark, they gather around a fire to tell ghost stories. There’s a carnival and a wedding and a birth. The characters have separate problems, but also shared ones: They all work for the same absent landowner, who pays them according to productivity—an arrangement that has left most of them living hand to mouth. They are also united by their faith, with the church depicted as a positive, humanitarian force in the community. Some Italian critics were irked by The Tree Of Wooden Clogs, which depicts hardship without issuing a climactic call to action. Whereas as many of Olmi’s peers made films with revolution on the brain and anger on the breath, Tree offers something close to a sigh of resignation; the characters don’t rise up, they keep their heads down, praying and hoping for the best. In one of the film’s most telling scenes, a bespectacled gentleman bombards a crowd of bystanders with Socialist rhetoric, attempting to inspire some fight in the peasants. Quickly, Olmi pulls focus away from this speechifying stranger to one of his protagonists, who spots a coin in the dirt; he successfully pockets the lost money and flees for his home, having completely lost interest in the rabble-rouser trying to earn his ear. Is this the director’s way of decrying interloping intellectuals, whose interest in the plight of the working man is wholly abstract and whose pleads for rebellion fail to take into account the realities of their lives? Or is Olmi just acknowledging that those with nothing are forced to find short-term solutions, because they haven’t the luxury of devoting their waking hours to sweeping social change? Either way, it’s easy to see why the movie stuck in craws. On the other hand, Tree also neatly sidesteps the didacticism of some Socialist cinema. It never seems to be preaching at or instructing its audience; the tactic is total immersion in this environment, with the “lessons” learned through context. There’s a fascinating ambivalence on display: While Olmi recognizes how hard and unfair this particular system of labor was, he also seems faintly nostalgic for a time in which communities were small, families stayed together, and there was little separation between people and nature. The opening scene is a gentle montage of natural splendor—weeds swaying in the breeze, water flowing in creeks, peaceful woodland clearings. Slowly, voices rise up on the soundtrack, the distant sound of men at work. 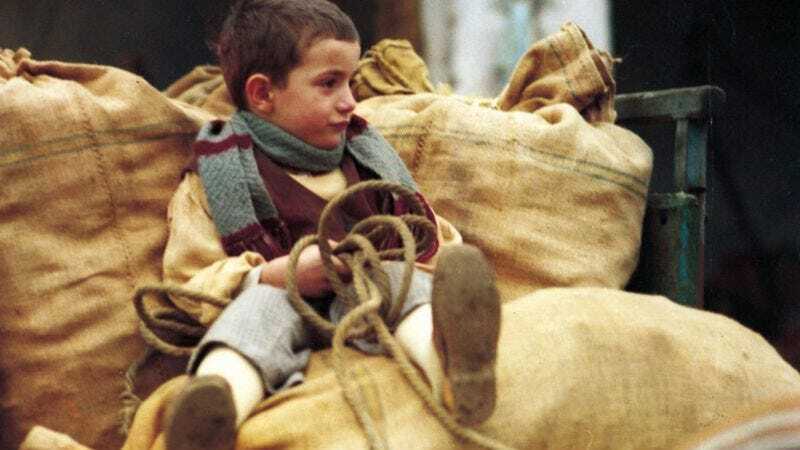 In a minute or so of screen-time, Olmi doesn’t just establish the unhurried pace of his narrative, a story that comes slowly to life, like daylight piercing the darkness of the early morning. He’s also foregrounded nature, and a close relationship to it, as a central theme. Only in the final minutes, when the film has arrived on a parting note of tragedy, does the meaning of that clunky title—and the full scope of Olmi’s outrage—become clear. The power of the film is cumulative; to watch it is to slowly build a kinship with these characters, to become invested in their uncertain fates, and perhaps to feel less like a silent observer than another member of the community. The solidarity is infectious—and so when it is violated, the sting is profoundly upsetting. The Tree Of Wooden Clogs may not issue the rallying cry its detractors demanded, but it’s hard to imagine anyone getting through its three hours without feeling a stirring of conscience. It renders the political personal, one planted crop at a time. Did it deserve to win? Yes. The Tree Of Wooden Clogs is a major achievement—somehow epic and intimate, saying something profound about its milieu without seeming to try to say anything at all. But there are a couple of runner-ups. The gonzo doppelgänger noir Despair fascinatingly collides the disparate sensibilities of three major artists: New German director Rainer Werner Fassbinder, screenwriter and playwright Tom Stoppard, and novelist Vladimir Nabokov. And while it failed to cause the stir (and scandal) of his previous film, In The Realm Of The Senses, Nagisa Ōshima’s comparatively tame Empire Of Passion is a haunting curiosity—a Japanese ghost story given the eccentric touch of its master filmmaker.